Stewchat...: I'm late, I'm late....but not too late for some Patchwork. I'm late, I'm late....but not too late for some Patchwork. Yesterday morning I was up to stage 6 above, when I heard the unmistakable 'kuuk' of a Raven, and it sounded close. I peered over the back field as a lone Raven flew very low to the ground past me before lifting up, over the village hall and away S. I was watching where it went, when I heard another Raven call, quite softly behind me. I turned to look at the sky above the copse next to our garden anticipating a fly over, when it appeared. First behind some bare branches then, it only pitched up on top of the large Ash tree next to the garden! It sent the Jackdaws and a few Rooks into panic mode. The Raven saw me, coupled by other corvids alarm and mobbing calls, and it flew off. This only angered the other crows even more who went in pursuit until they harried the larger bird out of sight. 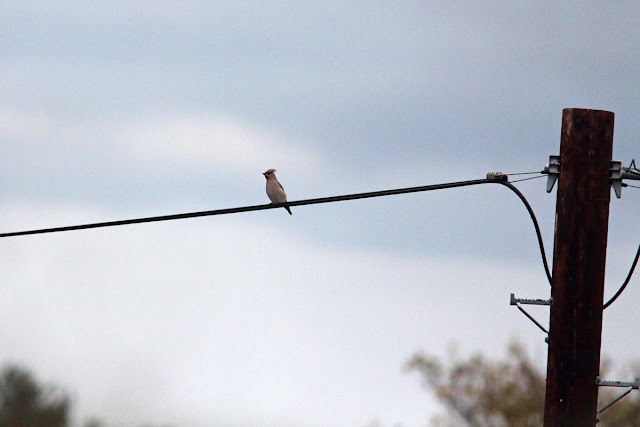 What great bird they are, especially when they can be seen from the garden. Now it was time for stage 7. Peggy's second walk of the morning is usually just a quick dash out before I go. 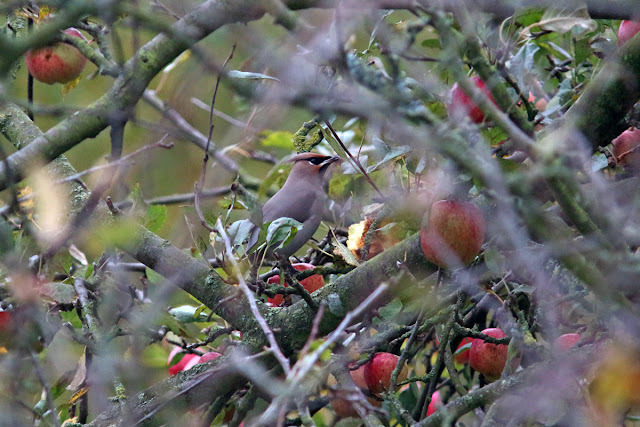 Today we were on the top coast road a few minutes from home when I caught the sound of a Waxwing trilling call. I couldnt see anything and thought I had misheard, when no, there it was again. I stared high up and picked up two birds heading south but decending too. A pair of Waxwings! They dropped straight into our village after their long flight. I could just about see them perched on a tall willow in a garden in the village and saw them drop off at a 45 degree angle. There was only one place that would pull them down like that - Davey's apple tree. Pegs and me turned ( she had been far enough anyway) and strode back home, passing the apple tree. Its very thick and hanging with fruit so I couldnt see anything. 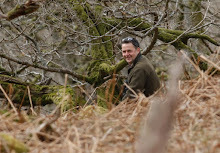 I swapped the dog at home for bins and camera and went back out. Its only 50 yards to Daveys from home, and sure enough right in the centre in the worst viewing place possible were the Waxers, getting stuck in to their apple breakfast. I watched for a few minutes and grabbed a few record shots before they flew off, stopping briefly and then continuing west. As I pondered them and wondered about getting back for work, more calls over head dawned on me, this time Crossbills, lots of them. First a low flock of 13 went south, quickly follwed by 5 and then 9 more accompanied by 3 Brambling. A good movement of Crossbills for here. 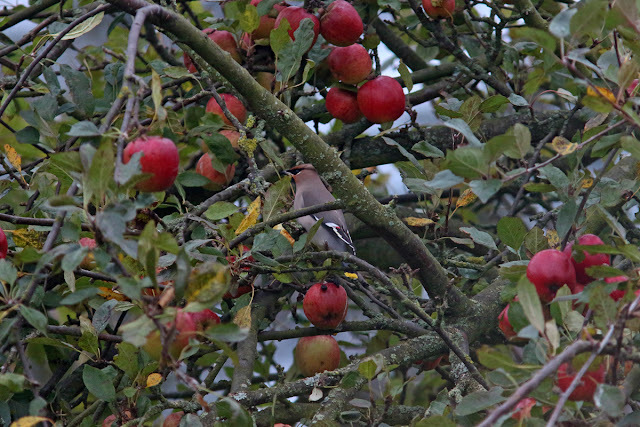 Some record shots of the waxwings. Pity I couldnt get two in one photo. Hopefully more will arrive over the coming week or two..
Keep the posts coming Stew. Always entertaining and inspiring!